Here at Catalyst Kids, our desire is to train up children to become life-long disciples of Jesus Christ. Basic components of our ministry include reading and memorizing God’s Word, pplying the Word to our lives, prayer, worship, serving our community, supporting worldwide missions, and having a whole lot of fun playing and creating together! Our Sunday morning program is called Area 51, which eludes to our key verse, Ephesians 5:1, “Be imitators of God, therefore, as dearly loved children”. Since the real Area 51 is a top-secret air force base in Nevada, our whole children’s building has a distinct military theme. Currently, we follow the Gospel Project curriculum, which goes chronologically through the stories of the Bible and brings the Gospel into each and every lesson. During our Sunday morning service from 10:30-11:45 AM, children ages 0-5th grade are welcome over at our children’s house (next door to the main building) for check-in starting at 10:15. If you are a first-time visitor, you are more than welcome to take your child to their class to see the room and meet their teachers. The safety of our children is a top priority. All of our volunteers have been through background checks and are easily identified by their green Area 51 t-shirts. Our mid-week Wednesday Night program is called BASIC Training, and runs from 7 PM – 8:30 PM. 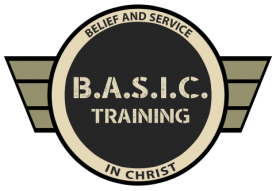 Fitting in with the Area 51 military theme, BASIC Training helps kids learn how to believe and serve Christ, their commander. If you have any questions, please contact our Children’s Minister, Jenny Ross.